Season your grilled chicken to perfection with this McCormick Grill Mates 23 oz. Montreal chicken seasoning. This chicken seasoning is a delicious blend of natural ground garlic, salt, onion, and other spices, meant for transforming otherwise ordinary meals into culinary perfection. This seasoning is great for adding a bold, savory taste to your juicy grilled chicken, turkey burgers, pork, or seafood. You can even use this seasoning to give your grilled vegetables a flavorful kick! McCormick is a name you can trust to deliver high quality spices every time. This 23 oz. 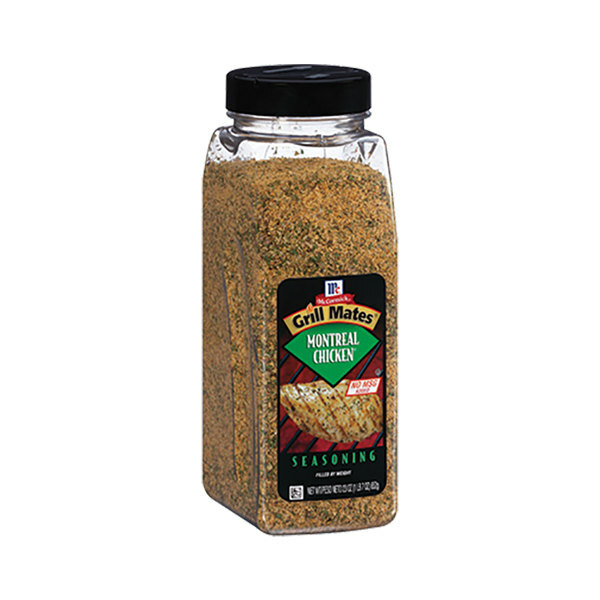 container provides a good supply of product and is easily accessible for your cooking and seasoning needs. Use McCormick to create and enhance masterful flavors in all your best dishes. Try it on the chicken breast and then grilled, makes the chicken takes very good. Price is good, shipping is fast, will buy from here again. This stuff is amazing! I purchased this and you get pretty good size for the price! The seasoning smells amazing! Cant wait to use it on everything!